On September 13 Dan Wood, who foundeded WORKac architectural studio with Amale Andraos , will be the guest of honour at the next event in The Architects Series, the cultural format curated by The Plan for SpazioFMGperl'architettura, the gallery and showroom of the Iris Ceramica Group’s Iris Ceramica and FMG Fabbrica Marmi e Graniti brands, offering a privileged point of view on some of the world’ps most important and innovative architectural studios. For the fourth event in the series we go to the New York studio of WORKac, which stands for Work Architecture Company, to discover the architects’ workspace and modus operandi. WORKac has developed more than 60 projects over the past fifteen years. The studio has designed architecture, urban planning and interior design projects in a number of countries all over the world, in North America, Europe, Africa, Asia and the Middle East. While awaiting the event featuring architect Dan Wood at SpazioFMGperl'architettura, we take a look at one of the studio’s recent projects: The Stealth Building, a contemporary home in a historic building which complies with the strict restrictions imposed by the New York City Landmark Commission. 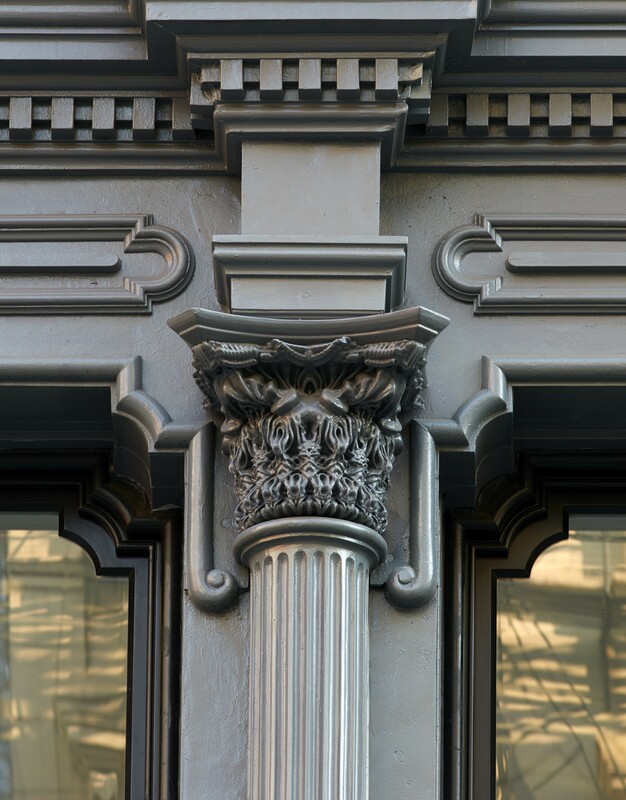 The architects of Workac renovated a historic building in New York’s Tribeca district which has one of the city’s oldest and most beautiful cast iron façades, built in 1857 and now completely restored. The architects chose its new coal-black colour as a reference to the history of the building, which has always stood out from the adjacent constructions, all lighter in colour. The restoration project also involved renewal of the capitals on the Corinthian columns of the façade, which had been ruined over the years; the new capitals were created in collaboration with artist Michael Hansmeyer, who created a digital version of the designs and used fractal technology to enlarge the floral motifs so as to obtain a design that reflects the old proportions even though it is made up of new forms. The New York City Landmark Commission asked that the image of the building’s old façade not be altered, making all expansions invisible from the street. The architects complied with the commission’s requirement by adding a new volume on the roof to complete the modern new home. The new volume was built following in-depth study of visual cones, for the building is located between two constructions of equal height, and its roof is visible from up to three blocks away. By exploiting the properties of the adjacent buildings, particularly the shadow of two pediments and the technical compartment of the existing elevator, the architects managed to conceal a sufficiently large part of the roof from view and build the expansion on this portion. The architects use elements inspired by nature in the interiors of this dramatic, sculptural new volume, and the building establishes a relationship with nature on the exterior with a vertical garden in the lobby and big balconies on the second, sixth and seventh floors. The building has won numerous awards, including the AIANY Merit award in 2017 and the ARCHMARATHON 2017 prize in the "Living" category.